Nevada State Route 375—a.k.a. 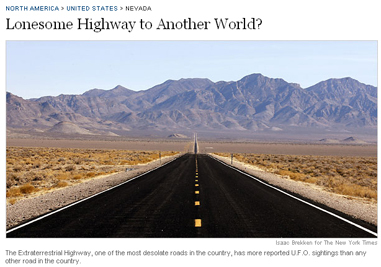 the Extraterrestrial Highway—is Alien Country, where more UFOs are sighted each year than at any other place on the planet. 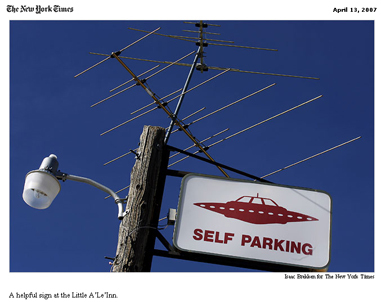 Earlier this year I visited the region on assignment for New York Times for a peek at life on the high desert, and to do some alien snooping myself, concentrating on the town of Rachel and the 75 or so residents who eek out a life in one of the most desolate places on the continent. I met people like Joerg Arnu, a 45-year-old software developer from Las Vegas who keeps a trailer parked on some land in Rachel. Mr. Arnu, a native of Germany who runs www.dreamlandresort.com, a popular Web site on Area 51, files a Freedom of Information Act petition each year to procure dates and times of major military testing periods. “That’s when all the action happens,” he said. My visit to the area coincided with Red Flag, the name Mr. Arnu gave a period in mid-February when military exercises out of nearby Nellis Air Force Base send a proliferation of jets into the air. Click here for my full story on the region, aliens, Area 51, Mr. Arnu, and all.